After months of planning and preparation, you’re ready to apply for retirement. To get your NYSLRS pension benefit, you need to send in an application. Let’s look at what you should include with the form to help make the retirement process go more smoothly. Know your registration number. You can find it on your most recent Member Annual Statement or retirement estimate. Know your past employment. To help ensure you receive the proper credit for your public service, please list your public employment history. Include any military service and memberships in other New York public retirement systems. Include your beneficiary’s information. You won’t make an official beneficiary designation with this form, but including these details will help us give you specific amounts for the pension payment options that offer a lifetime benefit for a beneficiary. See a notary. The form must be filled out completely and signed by a notary public. 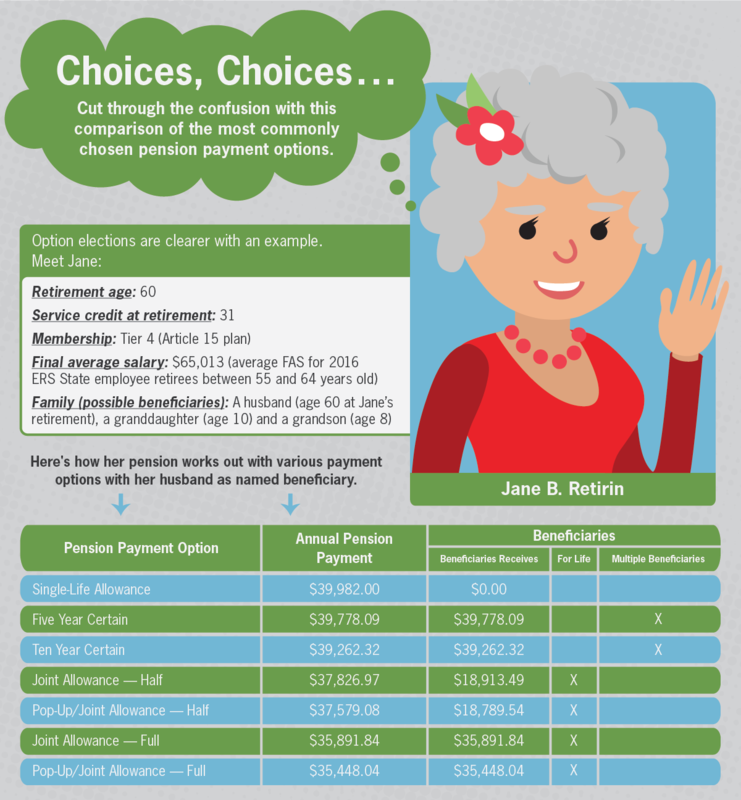 You’ll need to choose your pension payment option, or how you want your pension paid. Option election forms are available on our website, but we will also send you a form after we process your application. If you choose an option that provides your beneficiary a lifetime pension benefit when you die, you must provide proof of your beneficiary’s birth date. Your NYSLRS pension isn’t subject to New York State income tax, but it is subject to federal tax. You can fill out a W-4P form any time to tell us how much to withhold from your monthly benefit. We don’t withhold income tax for other states. Visit the Retired Public Employees Association’s website to see whether your benefit will be taxed in another state. Direct deposit is the fastest and most secure way to receive your pension benefits. You can enroll in our direct deposit program when you file for retirement. Just fill out a Direct Deposit Enrollment Application (RS6370), and return it to us. If an ex-spouse is entitled to part of your pension, you should send us a copy of your domestic relations order (DRO) as soon as possible. The DRO gives us specific instructions on how to divide your benefits. We cannot finalize your pension until we review it and calculate the court-mandated distribution of your benefit. For more detailed information, please read our Guide to Domestic Relations Orders. If you have other questions about applying for retirement, read our publication, Life Changes: How Do I Prepare to Retire? or contact us. This entry was posted in General News, Members and tagged Apply, Applying for Retirement, beneficiary, benefits, birth certificate, Countdown to Retirement, DD-214, defined benefit plan, defined benefit plans, direct deposit, Discharge from Active Duty, divorced, Domestic Relation Order, driver's license, DRO, ERS, Information is the Key, know your benefits, MAS, Member Annual Statement, members, monthly benefit, notary, NYSLRS, option election, passport, Payment Option, pension benefits, PFRS, Preparing to Retire, proof of birth, Ready to Retire, ready-to-retire members, registration number, retirement, retirement age, retirement application, retirement plan, retirement planning, W-4P on July 25, 2018 by NYSLRS. 1. Choose a sensible savings plan that works for you.There are several ways to save for retirement, including starting a deferred compensation plan like the New York State Deferred Compensation Plan. An important part of developing a savings plan is to start early. The sooner you start saving, the more time your money has to grow. Check out our Weekly Investment Plan chart to see how a weekly investment can grow by age 65. 2. Track your expenses and income. Tracking your current expenses for a month or two will give you a better idea of how much you’re likely to spend in retirement and how much you’ll need to supplement your pension. Use the expense and income worksheets on our website to create a retirement budget. Be sure to include periodic expenses, such as car insurance and property taxes. 3. Request a pension estimate. If you’re within 18 months of your anticipated retirement date, it’s a good idea to request an estimate of what your retirement benefit will be. You can do this by sending us an email using our secure contact form or by calling 1-866-805-0990 (518-474-7736 in the Albany, NY area). If you are not certain that you’ve received credit for all your public service in New York State, you can submit a Request for Estimate form (RS6030) and be sure to provide detailed information about your public employment in section eight of the form. If your planned retirement date is farther away, you may want to use our online Benefit Calculator. This estimates your pension based on information you provide, so have your Member Annual Statement handy before you start, or sign in to your Retirement Online account to check your current service credit. 4. Pay off any NYSLRS loans. An outstanding loan balance at retirement will permanently reduce your NYSLRS retirement benefit. You cannot make loan payments after you retire, and the pension reduction does not go away after we recover the balance of the loan. Visit the Loans page on our website for information about making additional payments or increasing your loan payment amount. 5. Consider seeking the advice of a financial planner. Financial planners don’t manage your money, but can help you assess your present financial condition and develop a practical plan to meet your specific goals and needs. Also consider doing your own research by seeking Do-It-Yourself financial planning guides on the web. If you ever have any retirement-related questions, please contact us. Content last revised January 17, 2018. This entry was posted in General News and tagged budget, defined benefit plans, ERS, FAS, Financial planner, Information is the Key, know your benefits, Loans, members, New York State & Local Retirement System, NYSLRS, NYSLRS Retirees, pension estimate, Preparing to Retire, public pension system, retirement, retirement age, Retirement Goals, retirement plan, retirement planning, savings plan on January 17, 2018 by NYSLRS. When you retire from NYSLRS, you’ll need to decide how you want to receive your pension benefit. You’ll have several options. All of them provide a monthly benefit for life. Some also provide a limited benefit for one or more beneficiaries after you die. Others let you pass on a monthly lifetime pension to a single beneficiary. Each option pays a different amount, depending on your age at retirement, your beneficiary’s age and other factors. That’s a lot to think about, so let’s make this clearer with an example. Meet Jane. Jane plans to retire at age 60, and she has a husband, a granddaughter and a grandson who are financially dependent on her. First, Jane needs to decide whether she wants to leave a benefit to someone after she dies. She does. That eliminates the Single-Life Allowance option. While it pays the highest monthly benefit, all payments stop when you die. Jane considers naming her grandchildren as beneficiaries to help pay for their college education. The Five Year Certain and Ten Year Certain options don’t reduce her pension much, and they allow her to name more than one beneficiary. If Jane dies within five or ten years of retirement, her grandkids would split her normal benefit amount for the rest of that period. However, the Five and Ten Year options wouldn’t be lifetime benefits. Since her husband doesn’t have his own pension, she’ll leave him her pension and look into a tax-deferred college savings plan for her grandkids instead. The Joint Allowance — Full and Joint Allowance — Half options continue paying all or half of the retiree’s normal benefit amount to the beneficiary for life. The Pop-Up/Joint Allowance — Full and Pop-Up/Joint Allowance — Half options also continue the retiree’s normal benefit. They reduce the pension a little more, but they have an advantage: If a retiree outlives his or her beneficiary, the retiree’s monthly payment will “pop up” to the maximum payable under the Single-Life Allowance option. Do you qualify for a death benefit? Do you have a mortgage or unpaid loans that will have to be paid if you die? These and other factors can significantly impact your retirement planning. To find out more about pension payment options, check your retirement plan booklet on our Publications page. You can also try our Benefit Calculator, which allows most members to estimate their benefits under the different payment options. For tips on developing a financial strategy that works for you, take a look through Straight Talk about Financial Planning for Your Retirement. Content last revised June 14, 2017. This entry was posted in General News, Members and tagged beneficiaries, beneficiary, benefit reductions, death benefit, defined benefit plan, defined benefit plans, ERS, Final average salary, Five Year Certain, Information is the Key, Joint Allowance — Full, Joint Allowance — Half, know your benefits, life insurance, New York State & Local Retirement System, NYSLRS, pension payment option, PFRS, Pop-Up/Joint Allowance — Full, Pop-Up/Joint Allowance — Half, Preparing to Retire, retirement, retirement plan, retirement planning, Service credit, Single-Life Allowance, Ten Year Certain on June 14, 2017 by NYSLRS. For anyone thinking about retirement, one big question looms: How much money will I have to live on after I stop working? 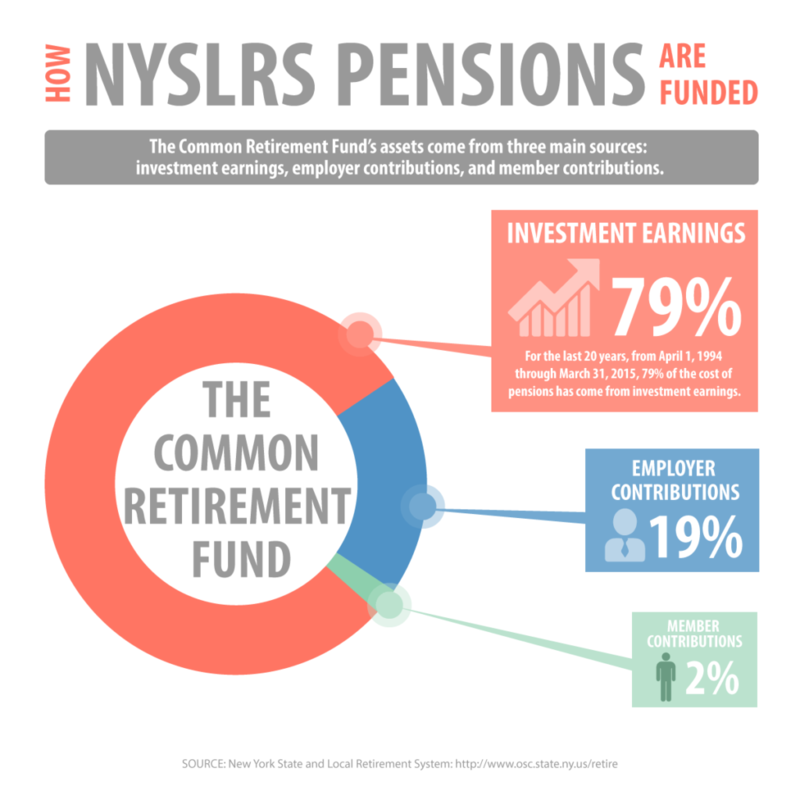 Your NYSLRS pension is a lifetime benefit. Having a good idea of what that monthly amount will be is essential to effective retirement planning. Fortunately, we offer tools to help you estimate your future pension. Most members* can use our Benefit Projection Calculator to estimate their pension. You can use this calculator even if your planned retirement date is a long way off. The calculator provides estimates based on information you enter. By changing each variable (date of retirement, average salary, beneficiary information), you can see the impact it would have on your pension benefit. 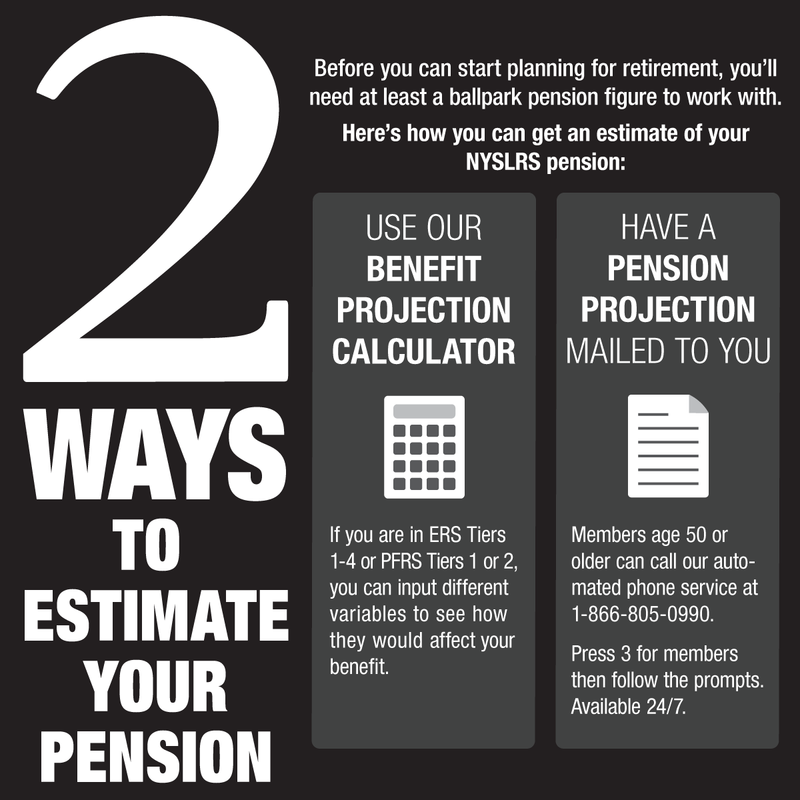 If you are a vested member who has enough NYSLRS service to be eligible for a pension, you can request a benefit projection by calling our automated information line at 1-866-805-0990 (518-474-7736 in the Albany, New York area). This service is available 24 hours a day, seven days a week. If you are nearing retirement eligibility and you aren’t certain that you have credit for all of your NYSLRS-eligible employment, complete and submit a Request for Estimate (RS6030) form. If you are a member of the Employees’ Retirement System (ERS), you may use this form if you will be eligible to retire within five years. Members of the Police and Fire Retirement System (PFRS) can submit this form within 18 months of their retirement eligibility date. As part of your retirement planning process, you may also want to check on your Social Security benefits. *At this time, you cannot use this calculator if you are in ERS Tier 5 or 6; PFRS Tier 3, 5 or 6; or certain special plans. Content last revised April 5, 2017. This entry was posted in General News, Members and tagged Benefit projection, benefit projection calculator, benefits, defined benefit plan, defined benefit plans, ERS, estimate, Information is the Key, know your benefits, members, New York State & Local Retirement System, NYSLRS, pension estimate, PFRS, Preparing to Retire, Request for estimate, retirement, retirement age, retirement plan, retirement planning, retirement security on April 5, 2017 by NYSLRS. 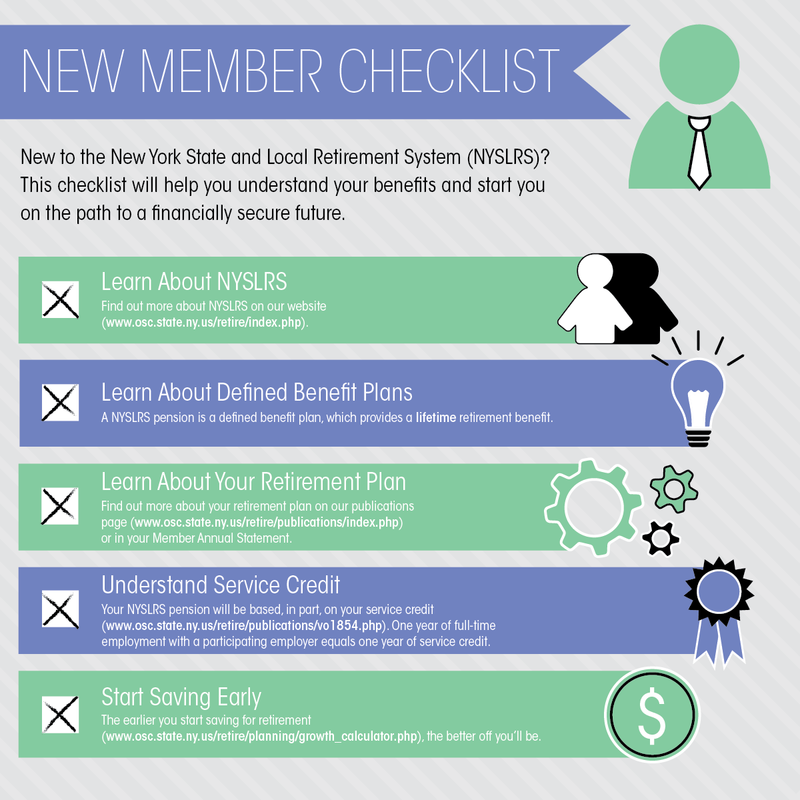 Welcome to new members of the New York State and Local Retirement System (NYSLRS). 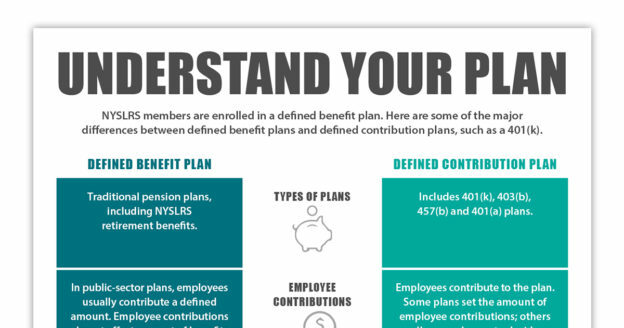 A NYSLRS pension is a defined benefit plan. Under this type of plan, once you are eligible for a pension and apply for retirement, you will receive a monthly payment for your lifetime. Your pension benefits are determined by a preset formula set by law. However, many employees in the United States, particularly in the private sector, are enrolled in 401(k)-style plans. The ultimate value of a 401(k) plan is based on the contributions made and investment returns. While 401(k) plans and other individual retirement accounts are a way to supplement your pension and Social Security payments, they do not provide the same level of security as defined benefit plans. Unlike your pension, these plans do not guarantee a lifetime benefit. Learn more about how pensions work. Your NYSLRS pension will be based on factors such as your tier, retirement plan, age at retirement, final average salary, and service credit. One year of full-time employment with a participating employer is equal to a one year of service credit. Part-time employment is prorated. You may also be able to buy service credit for previous public employment or military service, which in most cases would increase your pension. Because having a defined benefit pension plan is only one part of building a financially secure future, it’s essential that you save additional money for retirement. State workers and employees of participating local governments can take advantage of the New York State Deferred Compensation Plan. You can start by having as little as $10 deducted from each paycheck. You may choose how your money will be invested from a variety of options. Because of how compound interest works, the earlier you start saving, the better off you’ll be. You’ll find more information in our booklet Membership in a Nutshell. We also publish booklets about specific retirement plans. If you know which system you’re in (Employees’ Retirement System or Police and Fire Retirement System) and your tier, you should be able to find your plan. 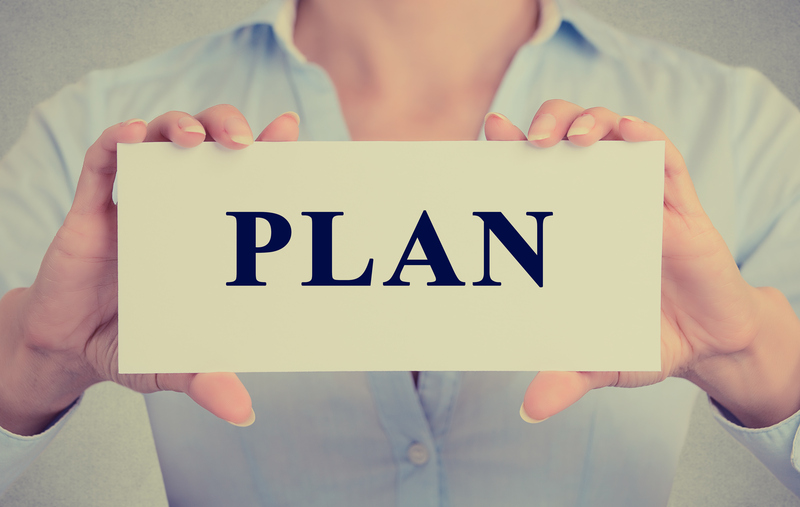 If you are not sure what plan you’re in, ask your employer. Content last revised March 9, 2017. This entry was posted in General News, Members and tagged benefits, checklist, compound interest, Comptroller Thomas P. DiNapoli, deferred compensation plan, defined benefit plan, defined benefit plans, ERS, FAS, Final average salary, Information is the Key, know your benefits, members, New Members, New York State & Local Retirement System, New York State Common Retirement Fund, New York State Deferred Compensation Plan, NYSLRS, One of America's Largest Pension Systems, Pension System, personal savings, Personal Savings Plan, PFRS, retirement planning, retirement security, Service credit, this public pension system works on March 9, 2017 by NYSLRS. 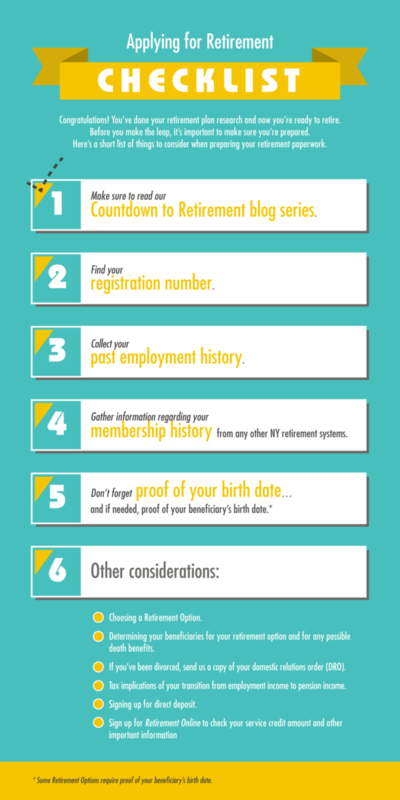 Tier 3 & 4 Members: When Is The Right Time To Retire? Tier 3 and 4 members qualify for retirement benefits after they’ve earned five years of credited service. Once you’re vested, you have a right to a NYSLRS retirement benefit — even if you leave public employment. Though guaranteed, the size of that benefit can vary. Age 55 is the earliest that Tier 3 and 4 members can claim their benefits. However, unless you have 30 years of service, a significant penalty for such an early retirement is imposed — a 27-percent reduction. The longer you wait to retire, the greater your benefit will be. At age 62, you can retire with your full benefits. Your final average salary (FAS) is a significant factor in the calculation of your pension benefit. Since working longer usually means a higher FAS, continued public employment can increase your pension. The other part of your retirement calculation is your service credit. More service credit obviously earns you a larger pension benefit, but after 20 years, it also gets you a better pension formula. For Tier 3 and 4 members, if you retire with less than 20 years of service, the formula is FAS × 1.66% × years of service; between 20 and 30 years, the formula becomes FAS × 2.00% × years of service. Everyone’s situation is unique. For example, if you’re vested, you no longer work for a public employer and you don’t think you will again, retiring at 55 might make sense. When you do the math, full benefits at age 62 will take 19 years to match the money you’d have received retiring at age 55 — even with the reduction. Our online retirement benefit calculator allows most members to estimate their benefit with different retirement dates, FAS and service credit totals. By changing each variable, you can see the impact it may have on your benefit. If you’re a Tier 3 or 4 member with five or more years of service credit, you can request an estimate based on your actual salary and service reported to date. If you’re age 50 or older, we can include additional, projected service credit based on a date of retirement up to five years in the future. To request your estimate, contact our Call Center toll-free at 1-866-805-0990 or 518-474-7736 in the Albany, New York area. You can also send us a Request for Estimate (RS6030) form. This post has focused on Tier 3 and 4 members. To see how early retirement affects members in other tiers, visit our About Benefit Reductions page. Content last revised May 3, 2018. This entry was posted in General News, Members and tagged benefit reduction, benefit reductions, defined benefit plan, defined benefit plans, Early Retirement, ERS, FAS, Final average salary, Full Retirement, full retirement age, Information is the Key, know your benefits, members, New York State & Local Retirement System, NYSLRS, Off payroll, PFRS, Preparing to Retire, request an estimate, retirement, retirement age, retirement planning, right time to retire, Service credit, Tier 3 & 4, Vested, vesting, waiting to retire on January 4, 2017 by NYSLRS. In August, we said that eligible NYSLRS retirees could expect a cost of-living adjustment (COLA) increase on September 30. A COLA payment permanently increases your NYSLRS retirement benefit. It’s based on the cost-of-living index, and is designed to address inflation as it occurs. The September 2016 COLA increase equals 1 percent, for a maximum annual increase of $180.00, or $15.00 per month before taxes. If you are due a COLA, you should have recently received a letter letting you know how much your 2016 increase is and how much your total benefit will be. If you receive your benefit by direct deposit (electronic fund transfer), you can expect to receive a second letter, which will describe the change to your benefit, before pension payments go out at the end of the month. The COLA you receive from NYSLRS is not the same as the COLA you might receive from the Social Security Administration (SSA). In 2016, the SSA didn’t provide a COLA adjustment for almost 65 million Social Security recipients. There are reductions, such as health insurance, which may offset the COLA increase. NYSLRS does not administer health insurance programs for its retirees. For New York State retirees, the New York State Department of Civil Service administers the New York State Health Insurance Program (NYSHIP). If you have questions about your health insurance premiums, you can visit the Department of Civil Service’s website or call them at 1-800-833-4344 or 518-457-5754 to learn more. If you retired from a public employer other than New York State (a county, city, town, village or school district), your former employer’s benefits administrator should be able to answer your health insurance questions. Visit our website to learn more about COLA and your eligibility. This entry was posted in General News, Retirees and tagged benefits, COLA, Cost of Living Adjustment, defined benefit plan, defined benefit plans, ERS, Healthcare, Information is the Key, know your benefits, New York State & Local Retirement System, New York State Department of Civil Service, NYSLRS, NYSLRS Retirees, PFRS, retirement security, Social Security Administration, SSA on September 21, 2016 by NYSLRS. 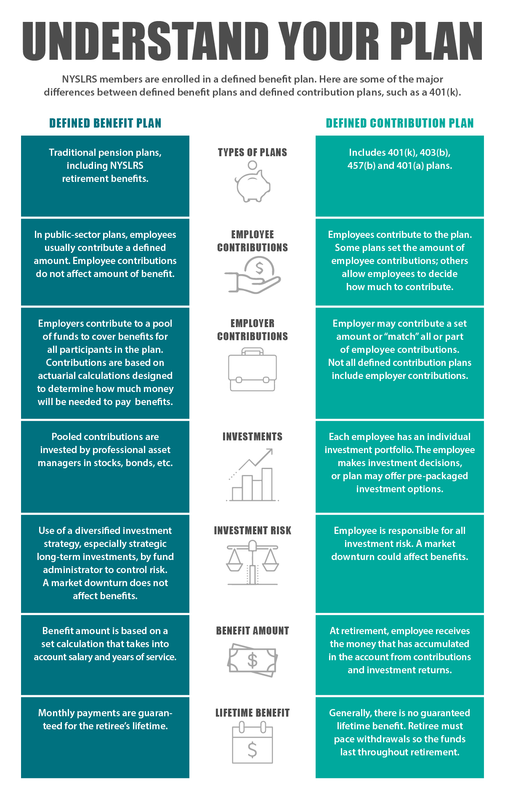 Minimize employer contributions through an investment program designed to protect and enhance the long-term value of the assets. Over the last 20 years, 79 percent of benefits have been funded from investment returns. When you retire from NYSLRS, your monthly pension benefit—and the benefits of many others—will be drawn from this fund. Ethical management and a long-term, diversified investment strategy has made NYSLRS one of the best managed and funded plans in the nation. A diversified investment strategy helps us meet the funding needs for our current and future retirees while also helping to control risk. An independent review of the Fund commended Comptroller DiNapoli and NYSLRS for strong policies and ethical management. By adhering to the highest standards of accountability and transparency, our members, retirees, and beneficiaries can be confident the Fund is being managed wisely. Content last revised August 18, 2016. This entry was posted in General News, Pension Fund and tagged Comptroller Thomas P. DiNapoli, defined benefit plan, defined benefit plans, ERS, Ethical management, Information is the Key, New York State & Local Retirement System, New York State Common Retirement Fund, NYSLRS, NYSLRS Retirees, One of America's Largest Pension Systems, Pension System, PFRS, public pension system, retirement security, Strategic Long-Term Investments, Strength Through Strategy, Strong New York, The Fund, this public pension system works, well funded, well run on August 10, 2016 by NYSLRS. When you retire, you’ll choose a payment option for your monthly lifetime benefit. Eligible NYSLRS members may also choose to receive a partial lump sum payment. The payment, which you’ll receive when we finish calculating your pension benefit, is a percentage of the actuarial value of your retirement benefit at the time you retire. By accepting this one-time lump sum payment, your lifetime monthly benefit will be permanently reduced. Who is Eligible for the Partial Lump Sum Payment? The percentage amounts you can choose from depend on how long you’ve been eligible to retire. You can choose a lump sum payment that equals 5, 10, 15, 20 or 25 percent of the value of your retirement benefit. The payment can be made directly to you, or you can also have it paid in a direct rollover to an Individual Retirement Annuity or other plan that accepts rollovers. Before you decide, you may want to speak with a tax advisor to see if the partial lump sum payment is right for you. Certain partial lump sum distributions could be subject to federal income tax. How Do I Choose the Partial Lump Sum? If you’re eligible for the partial lump sum, we’ll send you a special option election form when you file for retirement. You can use this form to choose both the partial lump sum and the payment option you want for your continuing lifetime monthly benefit. Please read Partial Lump Sum (PLS) Payment at Retirement – For Eligible Retirement System Members for more information. Content last revised May 4, 2016. This entry was posted in General News, Members and tagged benefits, county correction officers, defined benefit plans, deputy sheriffs, ERS, federal income tax, Individual Retirement Annuity, Information is the Key, IRA, know your benefits, members, monthly benefit, New York State & Local Retirement System, NYSLRS, Option Election Form, Partial Lump Sum, partial lump sum payment, payment, pension payment option, PFRS, PLS, Preparing to Retire, retirement, retirement planning, Sheriffs, undersheriffs on May 4, 2016 by NYSLRS.